Juventus head coach Massimiliano Allegri acknowledged Inter caused the Serie A leaders problems despite the Nerazzurri going down 1-0 in Friday's Derby d'Italia. A second-half header from Mario Mandzukic earned a narrow victory at Allianz Stadium, ensuring Juve levelled the record for the most points collected, 43, after 15 games of a season in Europe's top-five leagues. Inter started well and had the better chances in the first half, with Roberto Gagliardini hitting the post with a shot that had Juventus goalkeeper Wojciech Szczesny beaten. But Mandzukic came up trumps with a header from Joao Cancelo's left-wing cross to put Juve in an even more dominant position at the top of the Serie A table, despite Allegri accepting his side had to battle. 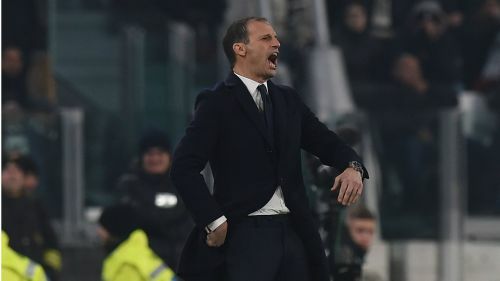 "Inter caused us problems in the first half, opening up with Joao Mario and Gagliardini, so we struggled to close them down," Allegri said to Sky Sport Italia. "It's also true the biggest chances of the first half came from us giving the ball away. "I moved Mandzukic to the left, Paulo Dybala played much better and we had a very different performance in terms of intensity and pressure. We allowed Inter practically nothing in the second half and we had several more chances. "Matteo Politano was putting pressure on, so I switched the full-backs to make the most of our characteristics and cover where needed, pushing on the other. Cancelo struggled a little with Politano in the first half, mainly the transitions. "We're working on Cancelo’s defensive approach and it must be recognised he has improved a great deal. "I asked with the crosses to avoid Milan Skriniar and Joao Miranda, to work on the full-backs who were less physical than we were in those roles. It was a good cross to find Mandzukic." Allegri's opposite number Luciano Spalletti was left frustrated by his side's inability to use the ball properly, although he defended a quiet individual performance from captain and star striker Mauro Icardi. "If someone takes the lead, of course it makes the difference, but we made too many banal and cheap errors," Spalletti told Sky Sport Italia. "There was one moment where we burst away and got behind their defence, but we failed to get the ball to the forwards. That can make the difference, as we struggle to be consistent for 90 minutes. "There is always someone who is too slow, who talks too much, who is careless and not on the same page as the others. "Unfortunately, Juve are smart and we are naive. They have a way of wasting five minutes after a foul. "Icardi did what he had to do, he ran hard and to be honest did far better tonight than in other occasions to track back and get the ball, combining with the midfield." Victory moved Juventus 11 points clear of nearest rivals Napoli, who host Frosinone on Saturday, in the Serie A table. But Allegri does not feel Juve, hunting an eighth consecutive Scudetto, are already assured of yet another title defence. "We knew the championship would not end today," Allegri added. "But we still absolutely had to avoid defeat."